Even though I don’t dress up and trick-or-treat for Halloween anymore, I still like getting into the dark, spooky mood of the holiday and channeling it in my style in more subtle ways. 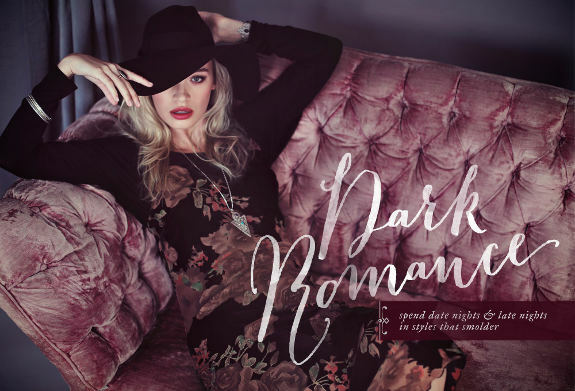 Threadsence’s new lookbook, “Dark Romance,” is perfect for just that – it’s all about rich, dark colors, romantic lace and florals, and edgy touches. This first look is seductive with a bohemian touch. My version dresses it up a bit, which makes this look perfect for a Halloween party or date (or maybe as the basis for a vampire/witch costume). Start with a high-low burgundy skirt and a cropped black top, then add a pair of sleek black knee-high boots. To complete the look with a romantic flair, grab a sparkly pendant necklace, a lace print clutch, and some deep red lipstick. This second ensemble also leans towards bohemian, but with a slightly vintage feel (and to me it screams “stylish witch costume” if you just switch out the hat and add a broomstick). Start by layering a black long-sleeve tee under a strappy, dark floral dress. Fall-ify it with cozy knit socks, chunky lace-up boots, and a floppy felt hat. Lastly, accessorize with boho jewelry, like a dangly pendant necklace and an intricate silver ring. This versatile outfit is casual enough to wear to class, but could also work for a fall date or weekend outing. Contrast the “dark romance” of a black lace dress with a cozy white sweater, then add some color with a pair of casual red booties. For accessories, a hand harness adds a trendy and edgy touch, while jeweled earrings help glam up the look. Don’t forget to grab a faux leather bucket bag on your way out the door. What do you think of Threadsence’s lookbook?Which outfit is your favorite? Would you turn one of these looks into a Halloween costume? Let us know in the comments!